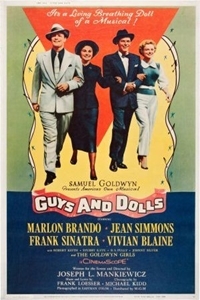 Synopsis: Guys and Dolls (1955 – Not Rated), starring Frank Sinatra, Marlon Brando, Jean Simmons, and Vivian Blaine. Brando stars as Sky Masterson, who takes a bet with Nathan Detroit (Sinatra) that he can’t get the virtuous missionary Sarah Brown (Simmons) on a date. When he starts falling for her for real, the stakes are as high as Detroit’s big crap game. The movie features some of the catchiest tunes in showbiz history – Lucky Be a Lady, Sit Down You’re Rockin’ the Boat, and Fugue for Tinhorns (I got the horse right here…) and has been called “the best picture Sam Goldwyn ever produced” (Chicago Reader). Guys and Dolls plays Tuesday, April 2 at 7 PM and again Wednesday, April 3 at 1 PM.